Turn the lights off, sit back and prepare for a climax of the senses. What you are about to experience is both visually and aurally exquisite. Nothing short of a manifestation of pure emotion. 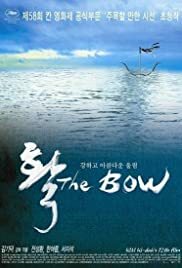 Yeo-reum Han is breathtaking in her role as a beautiful 16 year old child, bound to a boat in the middle of an ocean with her companion, 60 year old Seong-hwang Jeon. An elderly fisherman, he cares for her every need, feeds her, bathes her, and sleeps above her in an old bunk bed, desperately clutching for her hand in the middle of the night. You will begin this film as a spectator, and you'll leave the film with a small part of your soul and heart invested in this masterpiece. Ki-duk Kim teaches us what pure love looks and sounds like, and its a realisation that will haunt you for years to come.